22:50 With that dramatic penalty shoot out victory for the hosts, comes an end to our sport for the evening. And what a night it has been! I could sit here all night running you through every match, medal and miraculously marvelous moment from today, or even just this evening's action. 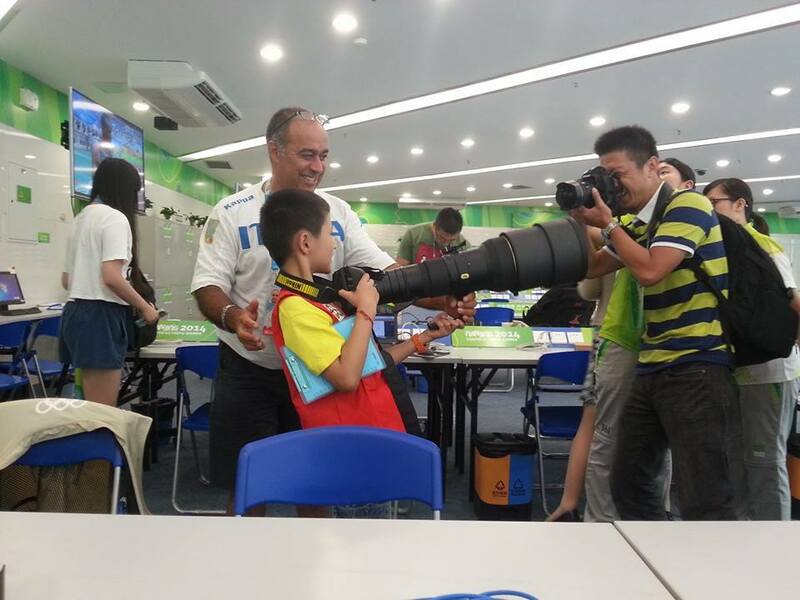 As much as I'd love to do that, a dinner and warm bed is awaiting me back at the hotel, so I will leave you instead with just a few photos that sum up this magical day of sport at the Nanjing 2014 Summer youth Olympic Games. Join us again at 09:00 for more of the same here in Nanjing. 22:43 Slovakia bag two in the shootout but it's not enough to prevent the Chinese steam engine rolling through to the final as the complete a 4-2 penalty shootout victory over Slovakia to set up a tasty encounter with Venezuela in the final. 22:37 There is still one sport with action ongoing at the minute, and that's taking place over at the Wutaishan Stadium where China and Slovakia have gone to penalties in the women's football semi-final. After a goalless encounter, Slovakia have still been unable to find the net as they trail 2-0 in the shootout. 22:13 And it's the Ghanaian who takes it. A storming run by Bissah sees her take gold in a PB time of 2:04.90. Ethiopia's Negeri comes in a second behind to take silver while the German seals bronze. 22:06 There's only one more gold to come now this evening and it'll be in the women's 800m. 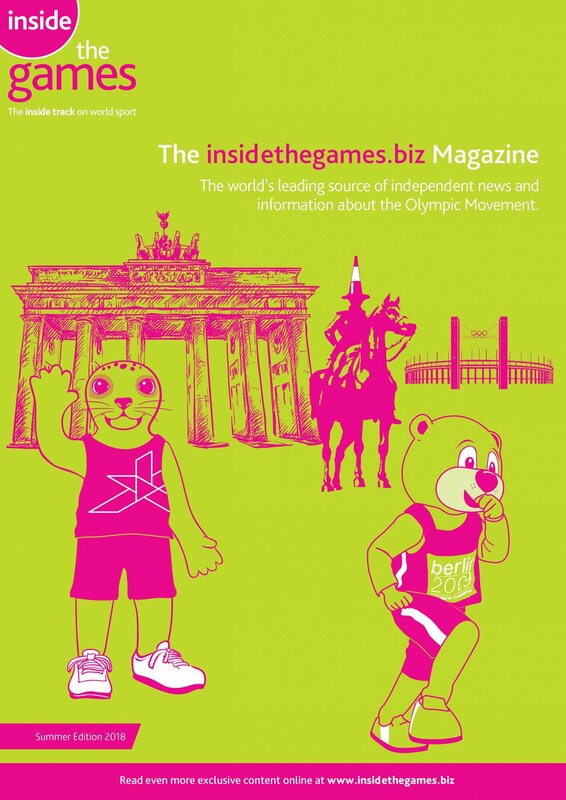 Ethiopia's Hawi Alemu Negeri will likely be the favourite, however, there are strong competitors from Ghana and Germany in the shape of Martha Bissah and Mareen Kalis respectively. 22:04 Make that four! Nikita Nagornyy wins his second gold of the night with an immaculate routine on the rings. 21:59 Russia are joining the Chinese medal surge this evening as Danil Lysenko adds a third for the sporting powerhouse. Lysenko clears 2.20m to cement the win after Japan's Yuji Hiramatsu and Australia's Shemaiah James can only reach 2.14m. The Japanese jumper will take home silver, however, due to fewer errors in previous rounds. 21:54 Back to the athletics and a personal best height of 4.36m courtesy of Angelica Moser has given Switzerland their first gold medal of the evening. The 17-year-old had already claimed the gold with a vault of 4.15m but pushed on in an effort to top the world youth record of 4.47m set by Sweden's Angelica Bengtsson in 2010. Bronze went to Slovenia's Leda Korselj. 21:51 Back to back Russian golds in the gymnastics as Seda Tutkhalyan matches Nagornyy's gold with one of her own. Hers comes in the women's uneven bars as she records a score of 13.575 to land top of the pile. Behind the Russian comes Italy's Losra Abdelaziz in silver, followed by China's Yan Wang. 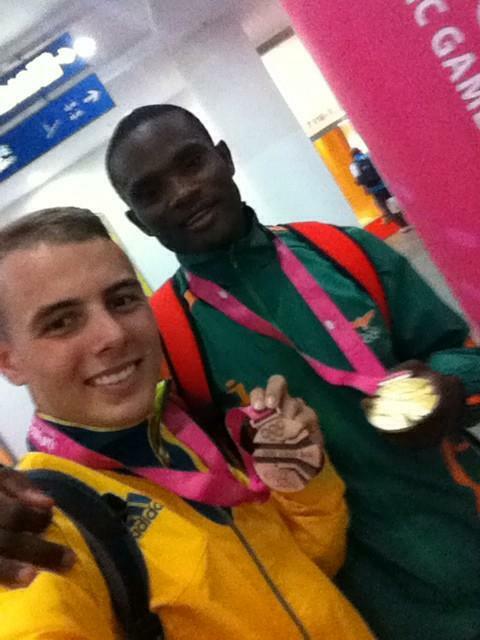 21:44 Sydney Siame of Zambia wins a thrilling boy's 100m showdown in 10.56 seconds. He wins by just one hundredth from Kenta Oshima of Japan. And a massive further three hundredths back is Trae Williams of Australia. 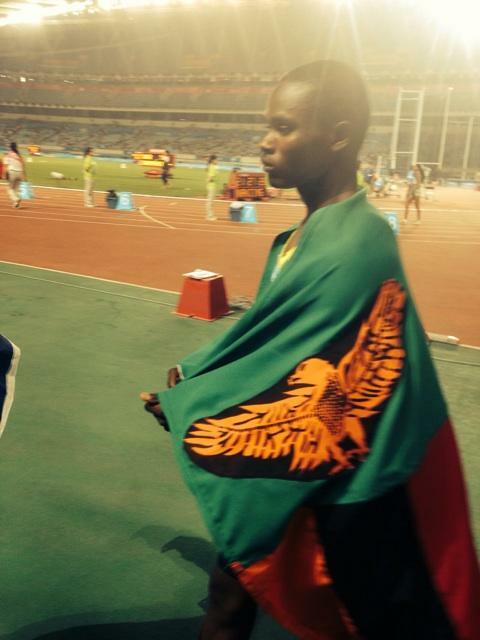 That is Zambia's first Olympic gold in any Games! And what an event to win it in! 21:43 So, the boy's 100m. And some big news on the startline as Jamaican favourite Ricardo Chambers is a non-starter. 21:38 The men's 100m is coming up, but just before that, a big result in tennis to bring you. Jumpei Yamasaki of Japan has teamed up with Ye Qiuyu of China to reach the mixed doubles final. We have been talking all week about how great the mixed team events are for international collaboration. 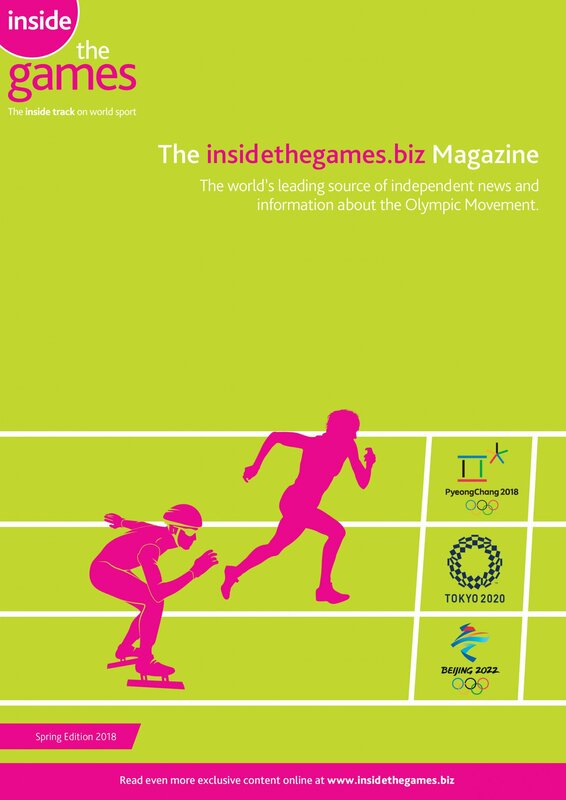 In fact, we wrote an article partly on this very theme earlier today: "Historic crossing of Taiwan Straits continues Youth Olympic theme of sporting unity". But, with all the historical and contemporary tension between Japan and China, including the boos at the Opening Ceremony, that is a great moment. They will face an all-European pair in the final: Jil Teichmann of Switzerland and Jan Stanislaw Zielinski of Poland. 21:30 Nikita Nagornyy of Russia has won the pommel horse title over in the gymnastics. 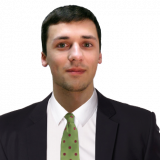 A score of 13.966 is enough to edge Ukrainian rival Vladyslav Hryko into second place. Timur Kadirov of Uzbekistan is third. Giarnni Regini-Moran of Britain is down in sixth place so will not add to his two gold medal haul. 21:24 But it's back to norm in the next event as Liang Xiaojing of China wins the girl's 100m. She clocks 11.65 to beat Paraskevi Andreou of Cyprus by six hundredths of a second, while Sam Geddes continues a good evening for Australia with bronze. 21:15 And then it's gold for Australia as Jessica Thornton runs 52.50 to win a 400m race in which the top five all run PB's. 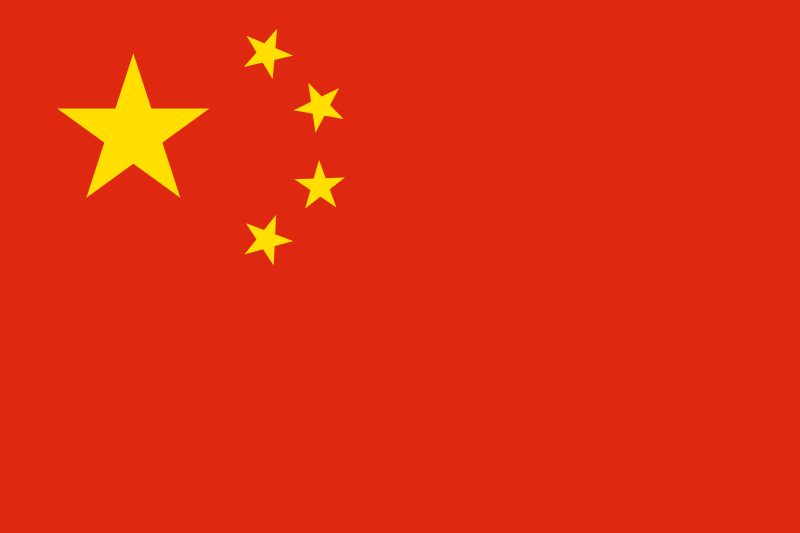 21:10 Sun Kangping of China wins the seventh host nation gold of the evening in the discus. She clears 52.79m to edge Ukraine's Al'Ona Byelyakova. Lara Kempka of Germany takes bronze. 20:58 A football result to bring from earlier as we move away from the medals for the briefest of moments. And it came after a penalty shootout. 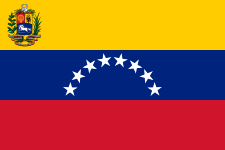 Venezuela getting the better of Mexico 4-3 in the shootout after a 1-1 draw in normal time. South America have won the only men's FIFA World Cup on Asian soil, Japan and South Korea in 2002 when Brazil beat Germany in the final. Could a team from the continent win either event here? China and Slovakia in the second semi-final is starting now. 20:53 Wang Yan wins China's sixth gold of the evening, in the fifth different sport, by claiming victory on the vault. Elissa Downie of Britain is second, ahead of Sae Miyakawa of Japan. 20:44 Giarnni Regini-Moran takes his second gymnastics gold of the Games. And I feel it may not be his last. The British all-around champion wins on the floor with 14.766. 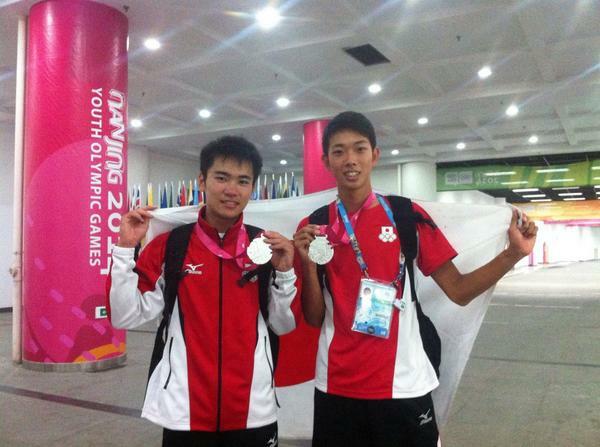 Kenya Yuasa and Lim Myongwoo, of Japan and South Korea respectively, take silver and bronze. 20:36 A new youth clean and jerk world record by the Armenian as well. That is some brilliant lifting by the 17-year-old. 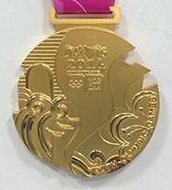 The country has won five Olympic medals in the sport, all bronze, with their only gold coming in Greco Roman wrestling in Atlanta 1996, courtesy of Armen Nazaryan. 20:31 Simon Martirosyan decimates the field to win the final weightlifting gold of Nanjing 2014, in the over 85kg competition. That is Armenia's second boy's lifting triumph of the Games. And what a way to end as the big man - I think we can call him that - clean and jerks 221kg, that is 34kg more than anyone else, to end up with a total of 391kg, that is 55kg more than the rest of the field. In a distant runners-up spot is Tamas Kajdoci of Serbia while Anthony Coullet of France takes bronze. 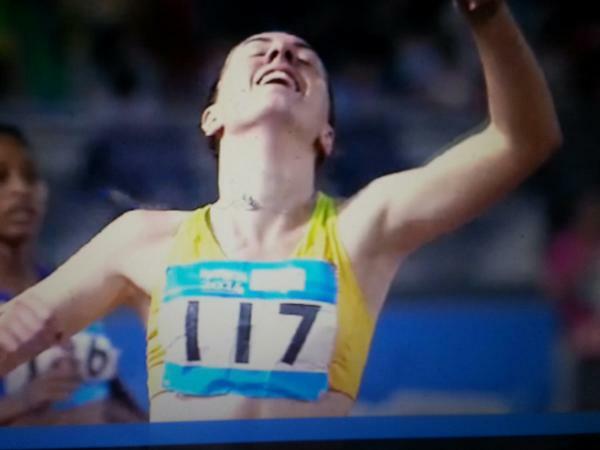 20:24 Yelyzaveta Baby of Ukraine wins the women's long jump gold with a personal best of 6.26m. Gold medals are being won thick and fast now. Beatrice Fiorese of Italy and Rhesa Foster of the US take silver and bronze. The boy's high jump and girl's discus are also getting underway. 20:16 What an evening it has been for China so far. 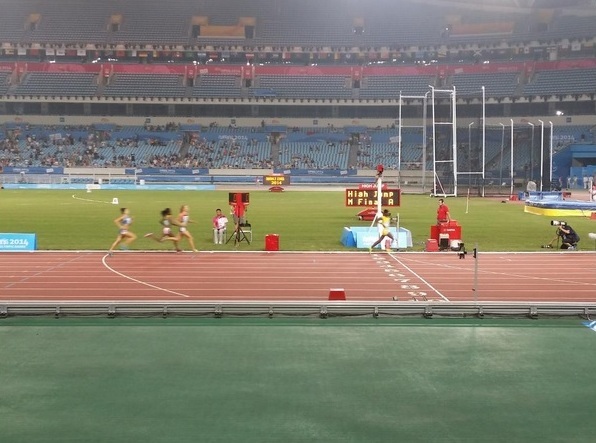 Two golds in athletics and further victories in diving, modern pentathlon and table tennis...After toying with the rest of the world for six days, the host nation are dominating Nanjing 2014 now. 20:10 It takes quite something to overshadow a table tennis match in China but I can now report that the host nation have notched up that team table tennis gold. A similar pattern, and result, to the singles final as Fan Zhendong beats Yuta Muramatsu after losing the first game: 10-12, 14-12, 11-5, 11-5. That means China beat Japan 2-0 and there is no need for the doubles. Hong Kong defeated Thailand earlier on for bronze. What a sensational run from Jaheel Hyde in the Youth WOG 110mh & in the process smashing the World Record in 12.96 seconds! Well done! - Mike Iverse is among the first to tweet his approval. 20:01 A stunning world youth record from Jaheel Hyde as he clocks 12.96 to win gold for Jamaica. The hurdles may be slightly lower than in the senior competitions but that is still a staggering performance. Henrik Hannemann of Germany takes silver in 13.40 and bronze goes to South Korea's Kim Gyeongtae in 13.43. The top four finishes all set PB's. 19:58 Up next on the track it is the boy's 110m hurdles and Jamaica's Jaheel Hyde is the massive favourite. He clocked a rapid 13.16 in the heats which would have won him gold at the Commonwealth Games and European Championships in the senior ranks over the last month. 19:55 Liu Gaoyang won the first match for China. The girl's singles champion won 11-3, 11-9, 11-9 over Miyu Kato of Japan. And then it is a repeat of the boy's singles final as Yuto Muramatsu resumes his rivalry with Fan Zhendong. The third and deciding doubles match is only necessary if the Japanese player wins this one. 19:47 Cheng Yulong of China wins the discus. He hurls it for a PB of 64.14m. Clemens Prufer of Germany and Ruslan Valitov of Ukraine take silver and bronze. 19:43 Ma Zhenxia wins the first athletics gold in the evening as she claims the 5,000m walk title in 22:22:08, a world-leading time but only a seasons best for the 16-year-old. Great to see her stop her watch as she crosses the line. Never trust those official timekeepers. In second place is Valeria Ortino-Martinez of Mexico, 57 seconds behind, with Noemi Stella of Italy taking bronze. 19:36 Interestingly, that means none of the individual event winners - in the fencing, swimming and run-shoot - finished on the final podium..."And why is it still called pentathlon," my colleague Paul, who has just returned from a McDonalds run, wonders as he munches his "first ever" Big Mac... Quite. 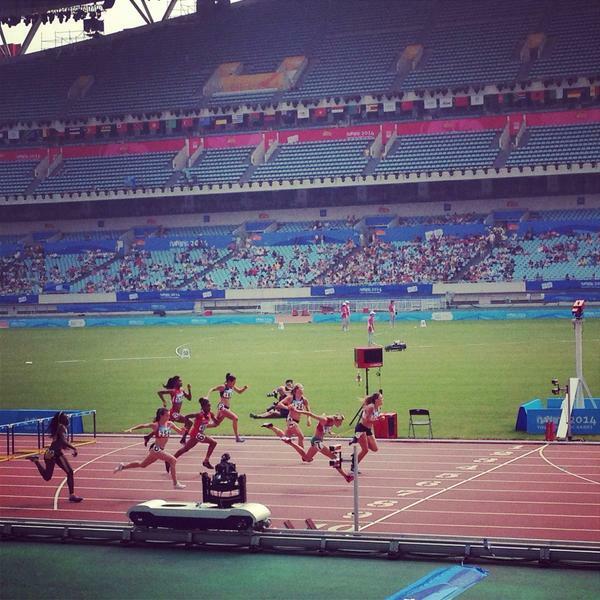 @UIPM_HQ @nanjing2014yog @Olympics Why is there no live coverage of the Modern Pentathlon at YOG please? - Britain's Sydney 2000 bronze medal winner Kate Allenby wonders about the lack of live coverage. 19:30 That means the gold medal goes to Zhong Xiuting of China, with 1054 points, ahead of Britain's Francesca Summers. In third place it is Anna Matthes of Germany. 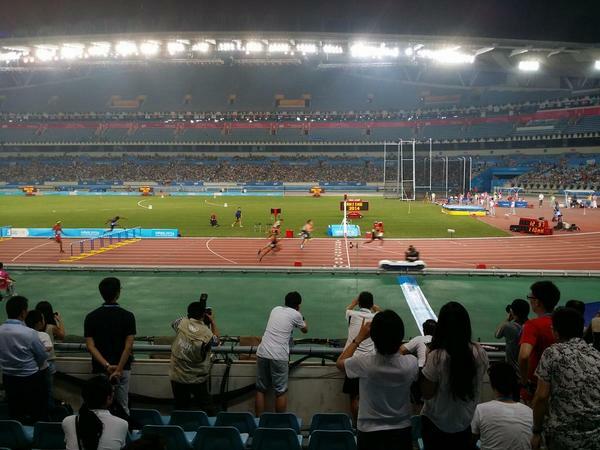 19:20 So, after six and two thirds of a day, we have our first evening of athletics medals action. It is the 5,000m girl's race walk up first. An interesting decision to put the longest event up first, so when the weather is still at its muggiest. 19:12 But interestingly, we have just received another release informing us the Sports Lab is closed tomorrow. Why? I hear you ask. Well, it didn't say, but after some old-fashioned investigative journalism, I discovered that massive storms are forecast tomorrow, and with the Lab completely unprotected from the elements, they have decided to take evasive action. 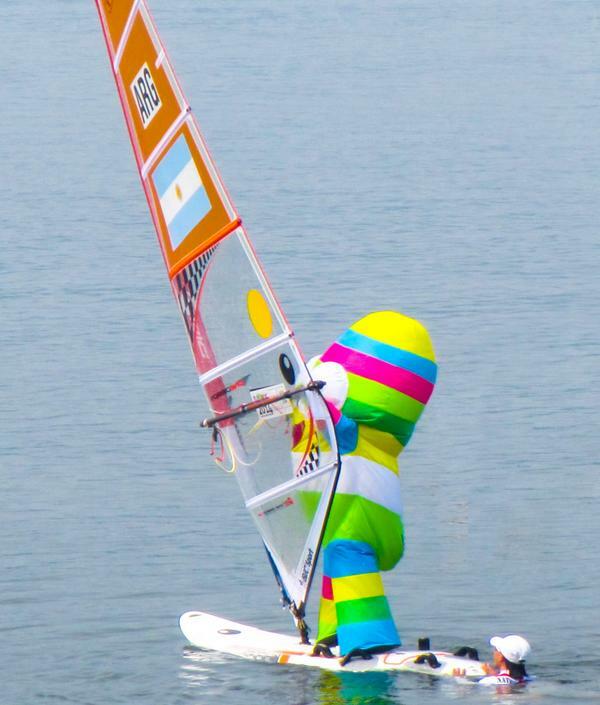 "Due to the low wind speed, and according to the competition policy and rules of the International Sailing Federation, NYOGOC has decided to postpone men's and women's sailing and windsurfer finals and victory ceremonies which were previously scheduled for August 23 to August 24, the second Reserve Day. The competitions are expected to begin at 11:00 in Course A. 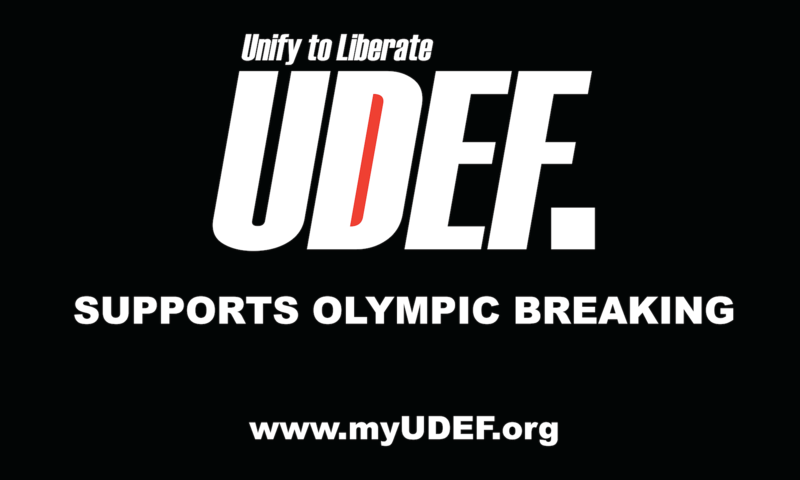 The tickets for competitions previously scheduled for August 24 remain valid." 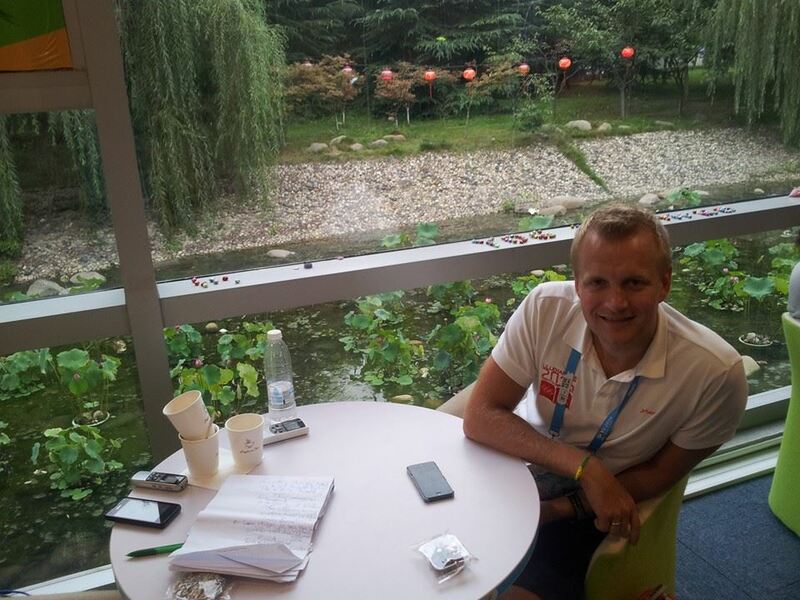 - An update from Nanjing 2014 about more delays with sailing. 18:59 It's the final weightlifting competition of Nanjing 2014 here tonight. And it's the big boys, the under 85kg competition. 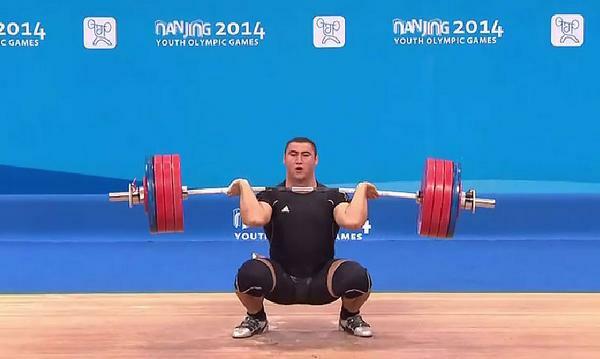 Serbian Tamas Kajdoci has just snatched a massive 150kg, but then Simon Martirosyan of Armenia manages 170kg. That is huge! 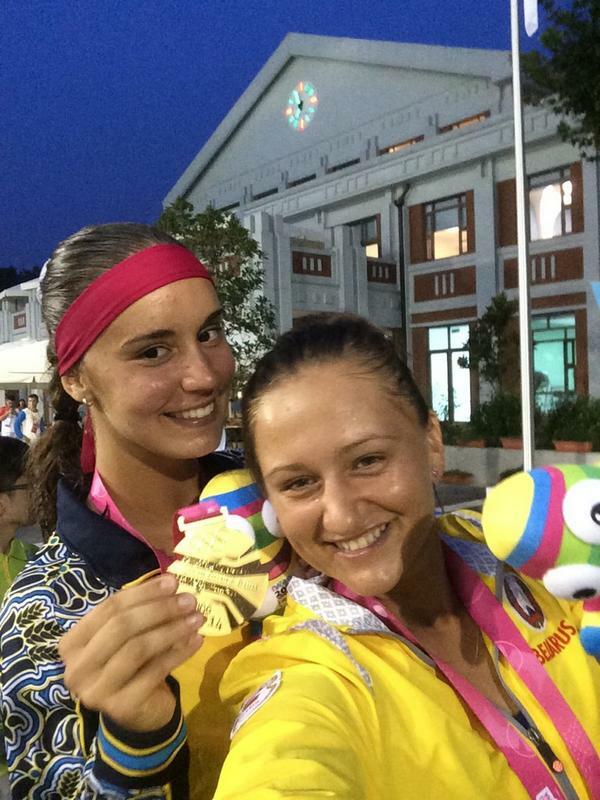 18:47 Ukraine's Anhelina Kalinina and Belarus' Iryna Shymanonvich have won gold in the doubles. They played each other in the singles earlier on but have proved formidable as a team. They beat Russian pairing of Daria Kasatkina and Anastasiya Komardina 6-4, 6-4 in 76 minutes. A neat volley winner to win it as well. 18:30 Speaking of gymnastics, we have five apparatus finals coming up this evening. 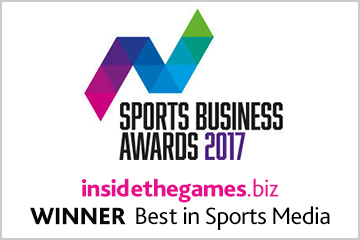 Along with a nine gold medals in athletics, and further ones in tennis, table tennis, weightlifting, and modern pentathlon. It's going to be a busy evening. 18:22 It's a very different programme this evening, with the traditional "first-week" sports of fencing, judo, shooting, badminton and swimming having now been replaced by the likes of modern pentathlon, archery, athletics, boxing and canoeing. In fact, there is only one sport left to begin here now. Any guesses? Think last in an alphabetical as well as a chronological sense...wrestling. The Greco-Roman programme begins on Monday (August 25) before the freestyle the following day. Rhythmic gymnastics is also yet to start but we are counting that within the wider gymnastics programme. 18:13 The pairing of Ukraine's Anhelina Kalinina and Belarus' Iryna Shymanonvich is proving effective yet again in the tennis as they take a one set lead in the women's doubles final. 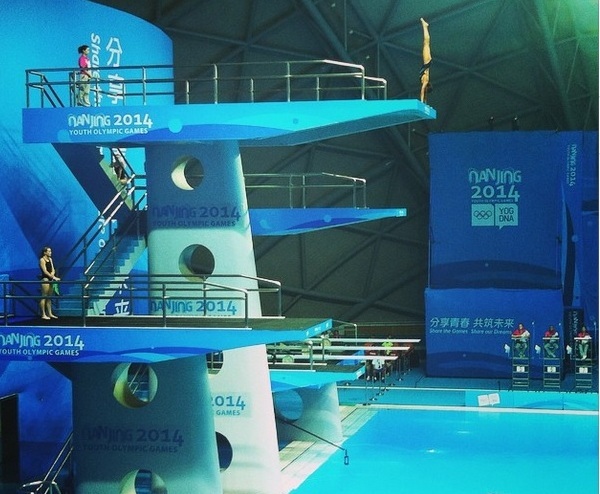 18:00 No slip up for China's Shengping Wu as she seals diving gold. The 18-year-old finishes with a total score of 324.20 to take gold in the women's 10m platform final. Bronze goes to Mexico's Alejandra Orozco Loza who finishes on 258.40. 17:54 We're into the quarter-final stage of the canoe-kayak head to head sprint competition. Belarus' Kamila Bobr, Ukraine's Liudmyla Luzan, Canada's Anne-So Lavoie-Parent and Mexico's Victoria Morales Cazarez have all progressed to the finla four in the women's C1 contest, with men's C1 races underway at the minute. 17:48 The second gold medal final of the evening in tennis now as Ukraine's Anhelina Kalinina must bounce straight back to her earlier disappointment in the women's singles to partner Belarus' Iryna Shymanonvich in the women's doubles. The pair actually played against each other in the women's singles semi-final with the Ukrainian coming out on top on that occasion. The duo face the Russian pairing of Daria Kasatkina and Anastasiya Komardina. 17:29 A trip over to the Wutaishan Basketball venue where the penultimate day of preliminary round action is upon us. China kick-started the play with a 22-10 victory over Indonesia, before Argentina and Poland recorded wins over Tunisia and Uruguay respectively. On court now is New Zealand and Brazil with the Kiwi men currently trailing 9-8. 17:14 Round A of the equestrian jumping has come to an end with eight athletes recording perfect rounds. Li Yaofeng of China, Michael Duffy of Ireland, Emily Fraser of New Zealand, Lennard Chiang of Hong Kong, Maria Gabriela Brugal of the Dominican Republic, Sabrina Rivera Meza of El Salvador, Martina Campi of Argentina, Jake Hunter of Australia and Mohamed Hatab of Egypt all scored zero in the first round and look good moving into the final round tomorrow. 17:05 Expect medals inside the Natatorium in the not too distant future as divers make their way to the high board for the women's 10m platform final. China's Shengping Wu dominated the qualifiers, finishing a 86.15 points ahead of her closest rival. 17:00 Quarter-final play is ongoing over at the Nanjing Youth Olympic Games Sports Park where the women are searching for a berth in the semi-finals of the hockey5s competition. The Netherlands recorded a comfortable 9-1 victory over Germany to ensure their spot in the final four while Argentina currently lead Uruguay by our goals to nil. 16:52 Canada's Kali Frances Sayers has put in a performance that would make even the 1976 Montreal team foil champion proud... As she secures 305 points in the modern pentathlon fencing competition. Great Britain's Francesca Summer is five points behind in second while China's Xiuting Zhong is a further five back in third. Spain's Aroa Freije Torneiro, winner of the swim, has yet another torrid time with the blade as she finishes 23rd and collects just 185 points. 16:40 Akvile Parazinskaite of Lithuanian has tidied up in the bronze medal match of the women's tennis, beating Ukraine's Anhelina Kalinina in straight sets to ensure a spot on the podium. 16:37 There's been a gold in the tennis! Poland's Kamil Adrian Majchraz is the man to take it as he seals a straight sets victory over Brazil's Orlando Moraes Luz. The 18-year-old had sealed the opener 6-4 and, despite a tougher battle, powered through to a 7-5 victory in the second. 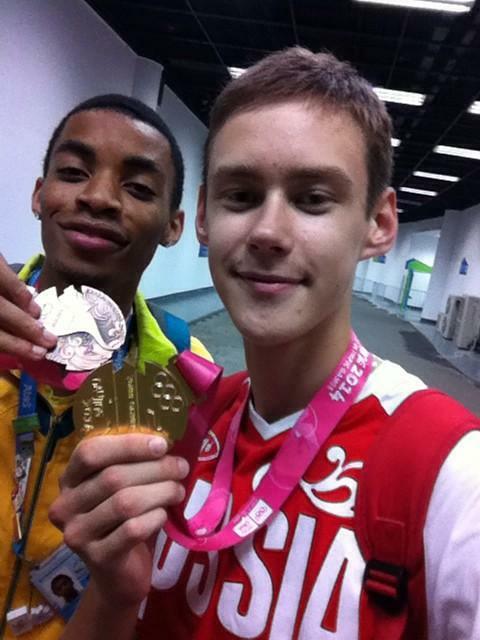 Bronze was won yesterday by Russia's Andrey Rublev. 16:25 The Canoes (and kayaks) are back out as we being the second session of the canoe-kayak head to head sprints. According to my trusty source on the issue, the primary difference between kayaking and canoeing is the number of blades used by the athletes. Kayaking involves a double bladed oar while the canoe just a single blade. Simples. First up is the men's C1 head to head sprint. 16:11 Poland's Kamil Adrian Majchraz is a set to the good in the gold medal final of the men's singles tennis. 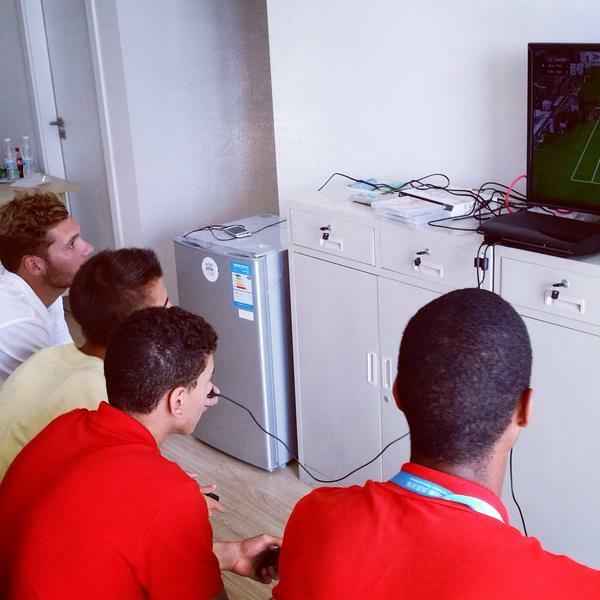 The Pole took a little shy of 30 minutes to record a 6-4 scoreline against Brazil's Orlando Moraes Luz in the opener. 15:59 Back to the archery and wins for Japan's Miasa Koike and Ukraine's Viktoriia Oleksiuk, Taiwan's Tzu-Yun Fang and Poland's Sylwia Zyzanska have seen them progress to the last 16 of the women's individual recurve competition, while Great Britain's Bradley Denny and Frenchman Thomas Koenig have followed suit in the men's. 15:46 More boxing results to sink your teeth into now as the women's light and middleweight bouts take centre stage. The former saw Ciara Ginty of Ireland record a win over Italy's Monica Floridia and Esra Yildiz of Turkey seal victory over Ukraine's Anhelina Bondarenko, while Poland's Elzbieta Wojcik beat France's Davina Michel in the latter. 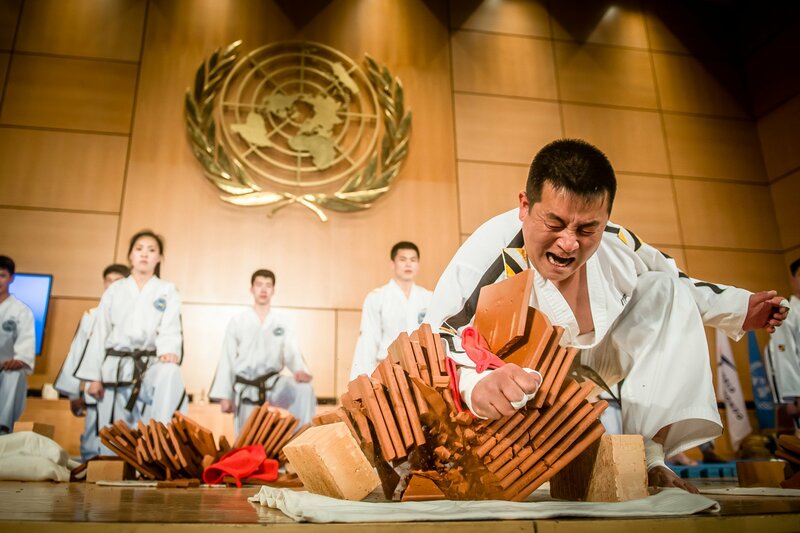 15:39 Equestrian has joined the list of live sport taking place here as new life is breathed into the sporting programme right across Nanjing. Finally! Round A of the individual jumping event is the current competition taking place at the Xinzhuang Equestrian venue with China's Yaofeng Li and Michael Duffy of Ireland tied for the lead. 15:14 The bronze medal match of the women's tennis singles competition is underway over at the Tennis Academy with Ukraine's Anhelina Kalinina taking on Lithuania's Akvile Parazinskaite. The court B match will be followed by the bronze medal playoff in the men's doubles. Action has just begun on court A where Kamil Adrian Majchraz of Poland fights for men's singles gold against Brazil's Orlando Moraes Luz. This match will be followed by thewomen's doubles final. 15:00 There's been a result in the women's modern pentathlon competition with Spain's Aroa Freije Torneiro winning the swimming contest. The Spaniard finished the 200m swim in a time of 2:14.67 to score 296 points. Behind her came Italy's Aurora Tognetti who scored 292 points with Anna Zs Toth just a point behind in third. Next up is the fencing contest, Torneiro finished last in the ranking rounds of this discipline yesterday so will be hoping for an improved result when action gets underway at 16:00. 14:48 A quick archery update for you now and Guatemala's Regina Romero has progressed to the women's individual recurve round of 16 after a 6-4 victory over Great Britain's Bryony Pitman. 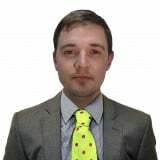 On the men's side, Marcus D'Almeida has secured safe passage to the next stage after a comfortable 6-0 win over Filipino archer Luis Gabriel Moreno, while Rick Martens of Belgium moves a step closer to the medals with a 7-3 victory against Belarus' Aliaksei Dubrova. 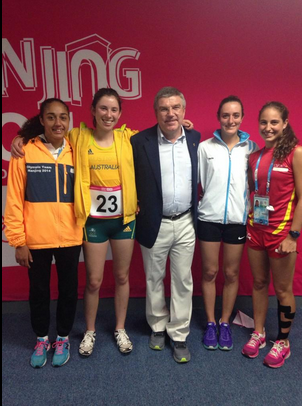 With Nastya Malyavina,@nanjing2014yog gold medalist from Ukraine, her coach and teammates.What a memorable moments! - IOC Executive Board member, National Olympic Committee of Ukraine President and pole vault world record holder, Sergey Bubka enjoying a taste of Ukrainian gold in the pool. 14:32 Results now coming in from the International Expo Centre as boxing gets underway for the first time at thee Games. China's Yuan Chang opened her campaign with a win, beating Taiwan's Hsiao-Wen Huang on points, while Armenia's Anush Grigoryan punched her way to victory against Kazakhstan's Balkibekova, again on points. - Belgium's Chloe Beaucarne is ecstatic with her bronze medal in the women's 100m hurdles. 14:20 Jiaman Li of China has progressed to the last 16 of the women's individual recurve competition after a solid 7-3 victory over Kazakhstan's Aruzhan Abrazak. Up next at the Fangshan Archery Field is Great Britain's Bryony Pitman against Guatemala's Regina Romero. 14:05 We're also underway in the boxing as the sport makes its first appearance at these Games. China's Yuan Chang meets Taiwan's Hsiao-Wen Huang in the women's flyweight division to open the the competition. 14:00 Is that the sounds of bows I hear? Yes, yes it is. That can only mean one thing, sport is back! China's Jiaman Li is the girl to thank as she begins her round of 32 women's individual recurve encounter against Kazakhstan's Aruzhan Abrazak. 13:42 Chinese diving great and Athlete Role Model Wu Minxia has told athletes to "never give up on your dream" as they pursue Youth Olympic glory at the Natatorium. It appears her advice has been headed by compatriot Shengping Wu who was in blistering form in this morning's 10m platform qualification round. The 18-year-old scored an incredible 86.15 points more than her closest competitor Zhiayi Loh of Malaysia, with finals to come later this afternoon. 13:23 Here's something I would like to see. IOC President Thomas Bach has told a group of young Kiwis that he will perform the "Haka" before Executive Board meetings after the young Olympians taught him the a traditional Maori haka called "Ka Mate". "I'll do the haka haka from now on," Bach said. 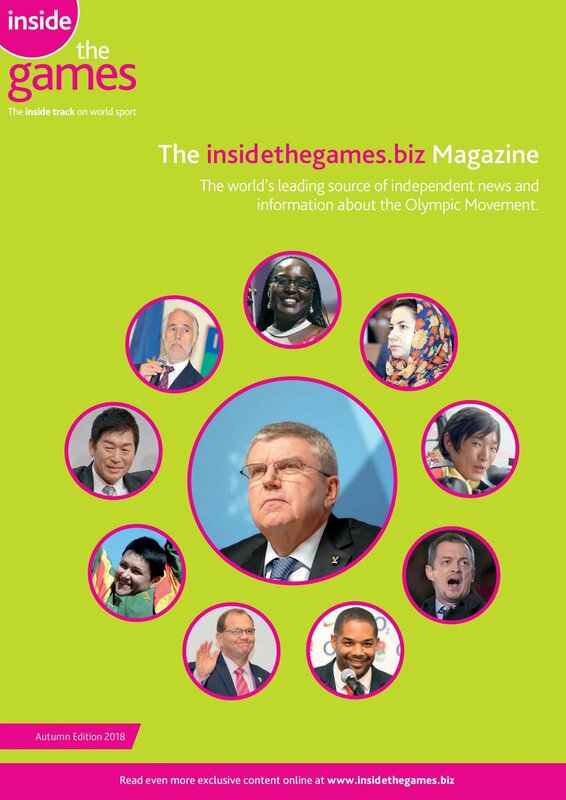 "At my next board meeting of the IOC I will start with [the haka]. The meeting will be very easy after that." 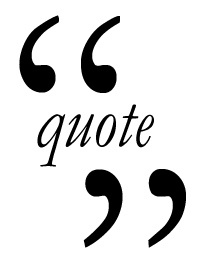 13:00 Okay, apologies, maybe that was slightly longer than anticipated. I do come back with news, though. It has been announced that the Chinese Premier Li Keqiang will attend the Closing Ceremony of the the Games, due to take place on Thursday (August 28). Li will be joined at the ceremony by Antigua and Barbuda Prime Minister Gaston Browne, Djibouti's Prime Minister Abdoulkader Kamil Mohamed and Madagascar's Prime Minister Kolo Roger, following an invitation by the Chinese Premier. 12:40 Rather oddly, the end of the table tennis brings an end to all sport here in Nanjing for a while. An hour and 20 minutes in fact. Maybe it's time to grab a quick cup of tea and a biscuit, maybe a bourbon if I'm lucky. Meet back here in five? 12:30 It's all over in the table tennis as Fan Zhendong seals a straights sets (or games, we've been debating the correct terminology for a while at the media centre) victory over Thailand's Padasak Tanviriyavechakul to secure a 2-0 win in the mixed international team event. 12:16 Competition in canoe-kayak was ongoing this morning with C1 and K1 head to head sprints taking place between both men and women. Kamila Bobr of Bulgaria and Kirti Kewat of India won the heats in the women's C1, with Serghei Tarnovschi of Moldova taking a victory in the men's C1. In the K1, Inna Nikitina of Russia won her qualification heat in the women's contest and Stanislau Daineka of Bulgaria followed suit in the men's. 12:04 Only one sport is currently in action here in Nanjing as China lead Thailand by a match to nil in the mixed international teams semi-final. Gaoyang Liu won the opener against Tamolwan Khetkhuan while Fan Zhendong sits two sets to the good against Padasak Tanviriyavechakul. 11:53 Competition has ended in both the athletics and diving for the time being. China's Shengping Wu has dominated the diving, finishing 86.15 points clear of her closest competitor in the women's 10m platform. 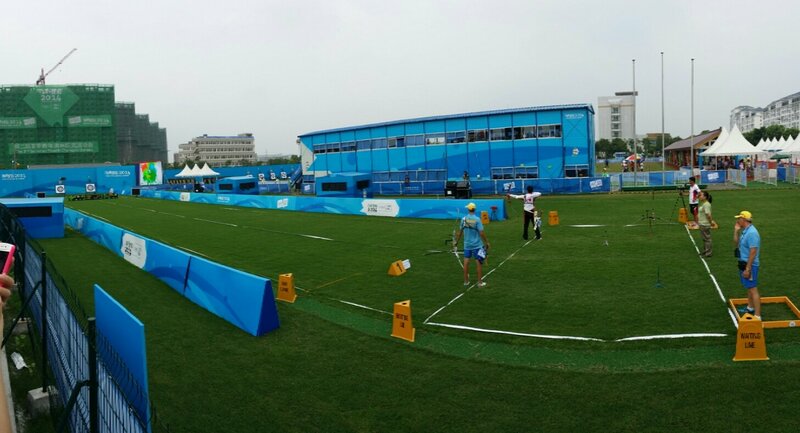 11:48 Men's and women's individual recurve archery is one of just three sports ongoing at the minute. This morning's action has seen wins for South Korea, Venezuela, Malaysia, Turkey, Italy, Switzerland, Taiwan, France, India, Mexico, Slovenia and Spain. 11:37 Japan are guaranteed at least silver in the table tennis after a 2-1 victory for Yuko Muramatsu and Miyu Kato in their semi-final clash with Hong Kong. China's Fan Zhendong and Gaoyang Liu now take on Thailand's Tamolwan Khetkhuan and Padasak Tanviriyavechakul for a spot alongside the Japanese duo in the final. With Liu leading Khetkhuan in the opening women's singles clash, could it be another Fan/Muramtsu final? 10:54 A couple of familiar faces are in action in the table tennis as I type where Japan and Hong Kong are going head to head for a berth in the mixed international team final. Men's individual silver medallist Yuko Muramatsu is partnered with fourth placed finisher in the women's contest Miyu Kato, while the Hong Kong pairing consists of women's individual silver medallist Hoi Kem Doo and Ka Tak Hung who took eventual gold medal-winner in the men's contest, Fan Zhendong, into a fifth set playoff in their quarter-final encounter. An even match up on paper which is proving to be the case in reality as the teams sit level on a match apiece with the third, the doubles contest, currently tied at 1 set all. It's all square at 7-7 in the third. 10:34 Our first taste of diving has begun inside the Natatorium where the women have taken to the 10m platform. Rather unsurprisingly, it's China who lead the way with Shengping Wu sitting head and shoulders above the rest after three exceptional dives. Wu is no newcomer to the international diving scene having picked up gold medals in two FINA World Diving Grand Prix events in Montreal, Canada and Fort Lauderdale, United States. 10:30 That's it for medal action in the athletics for a while and, although their will be a fair few minor finals, none will be contests for medal glory. The next chance of an athletics medal will come in the women's 5,000m race walk at 19:00. A number of the athletes competing in that have set personal bests already this year, making for what should be a brilliant race to start our evening of medal-laden action. 10:16 That's a first gold medal of the Games for Jamaica but you'd fully expect that figure to rise as the athletics action continues inside the Nanjing Olympic Sports Centre Stadium. 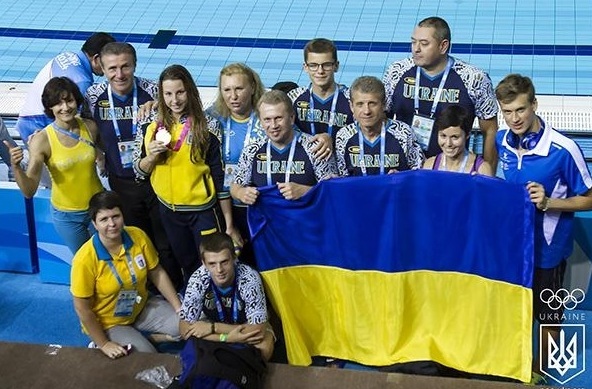 They have, however, surged up the medal table with just that one gold to their name, joining a host of nations sitting on the one gold medal mark. 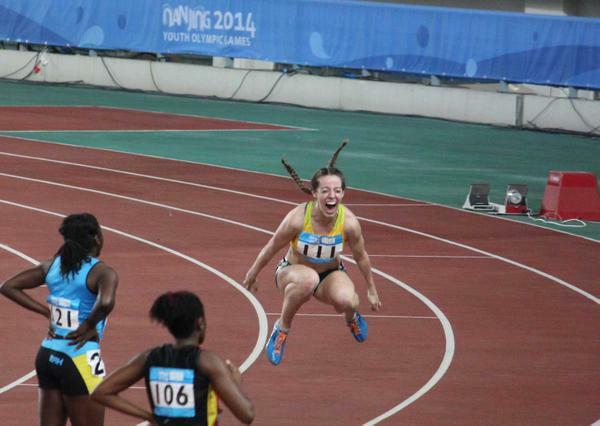 10:09 When the athletics action begins, one thing is always guaranteed - Jamaican gold. That's no different here at the Youth Olympic Games as Martin Manley blows away the field to take gold in the men's 400m final. The young Jamaican finishes 0.35 seconds ahead of Botswana's Karabo Sibanda with The Bahamas' Henri Delauze in third. 10:01 It's almost time for our second gold medal of the day as the men's 400m finals take to the track. Before the A final takes place, composed of the fastest runners in qualifying, Final C and B will complete the distance. 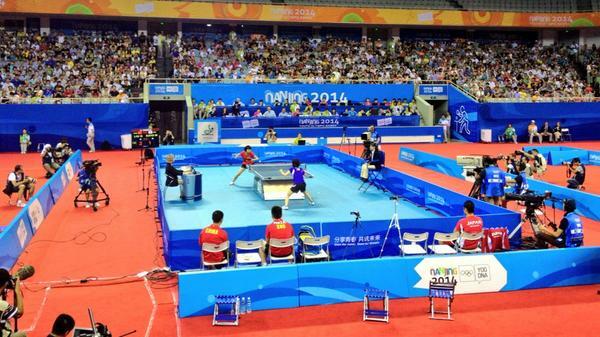 09:42 Today marks the final day of table tennis action over at the Wutaishan Gymnasium. China, unsurprisingly, won both gold medals on offer in the competition so far (men's and women's singles). 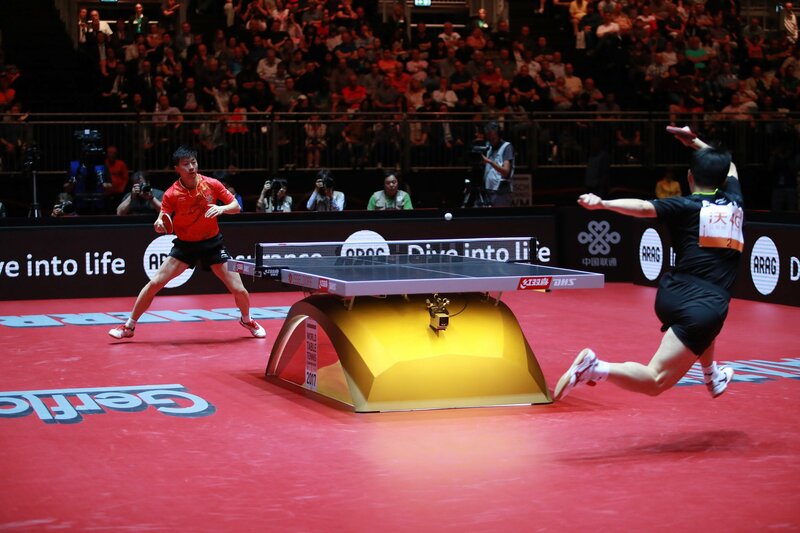 They are in a good position to secure the hat-trick as their mixed international team of Fan Zhendong and Gaoyang Liu, the respective winners of the singles medals, battle Thailand in the second of two semi-finals - Japan and Hong Kong compete in the second. Although titled the mixed international team event, NOCs who qualify one male and one female in the singles event will see these two players team up in the mixed team event. 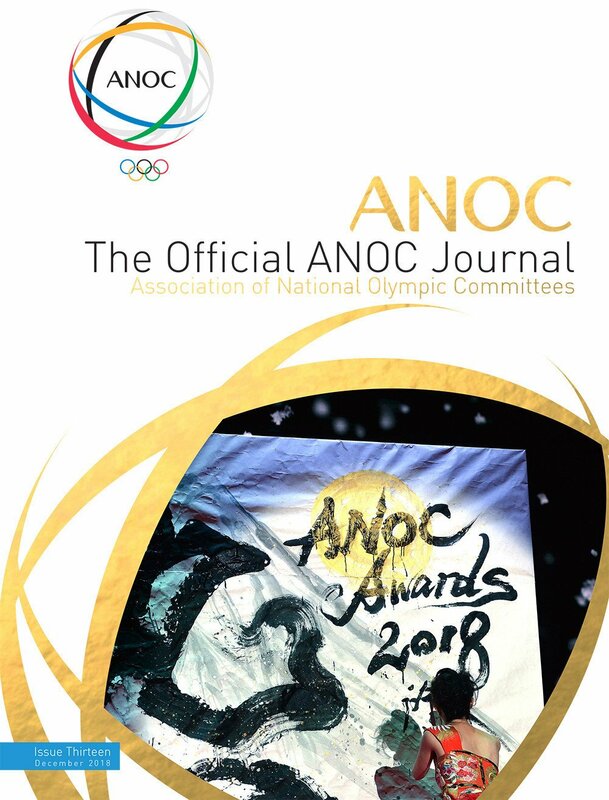 If an NOC qualifies just a single man or women then that player must then team up with a player of the opposite gender from the same continent. Europe 2, consisting of Sweden's Elias Ranefur and Israel's Nicole Trosman were the only continental team to make it to the quarter-final where they were subsequently knocked out by Japan. 09:30 Put down your cereal, there's been a gold medal already here in Nanjing! Laura Valette definitely woke up on the right side of the bed this morning as she runs a personal best time of 13.34 to win gold in the women's 100m hurdles! She is just 0.04 seconds ahead of Bulgarian hurdler Elvira Herman who takes silver while Chloe Beaucarne of Belgium secures bronze. 09:20 As well as a first day of diving; boxing and canoe-kayak are both set to join the sports programme today as we cross the halfway point in terms of sporting action. 09:13 Other medals are set to be won in the gymnastics, where we have the first day of apparatus finals; the sailing, dependent on the weather...; the diving, where we have our first of five action packed days; the table tennis; the modern pentathlon; the tennis; and the weightlifting. 09:05 I hope you all had a good long rest last night as you're in for a full-on medal bonanza here today with a whopping 28 medals up for grabs. The majority of these will come from the Nanjing Olympic Sports Centre Stadium as we begin out first day of medal action in the athletics. They don't hold back here at the Youth Olympic Games either, with 13 gold medals set to be handed out inside the Stadium. The first of these will come in the women's 100m hurdles and men's 400m this morning, while the other 11 will be decided this evening. 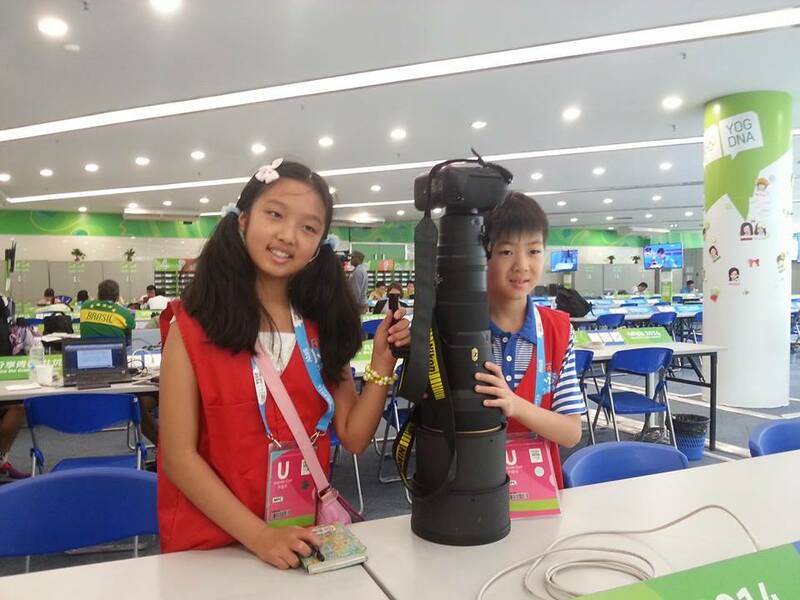 09:00 Hello and welcome back to the insidethegames live blog brought to you directly from the heart of action at the Nanjing 2014 Summer Youth Olympic Games.